Who Is Liable for an Iowa Slip and Fall Accident? | Hupy and Abraham, S.C. 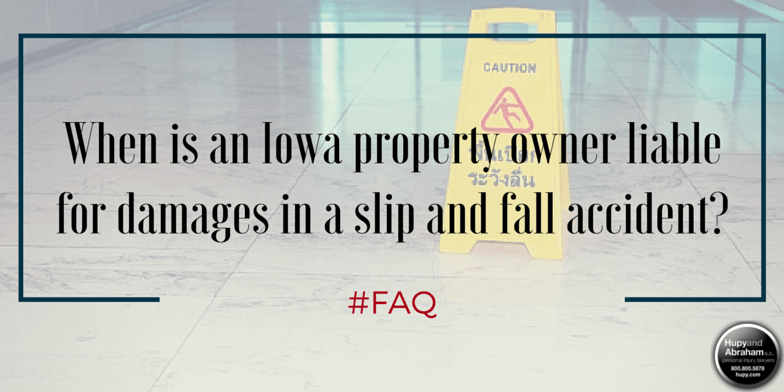 When is an Iowa property owner liable for damages in a slip and fall accident? Iowa law does not always hold property owners liable for injuries sustained in falls on their properties. It would be unfair to do so. A property owner is not legally responsible for accidental injuries to trespassers, for example, nor is a property owner liable for a freak accident that could not be foreseen. Instead, Iowa property owners have a duty to exercise reasonable care in the design and maintenance of their properties. They may be liable for fall accidents that occur when they fail to exercise reasonable care and a lawful visitor is injured. The foreseeability of potential harm. The reason why the person was on the property. The time, manner, and circumstances surrounding when the person entered the property. How the property is used or is expected to be used. Whether an inspection, repair, or warning was reasonable. Whether the property owner or occupier had the opportunity to repair or give warning of the potential danger and how easy it would have been to make the repair or give warning. The burden on the property owner, occupier, or community to provide adequate protection. This includes any inconvenience or cost involved in providing protection. While the Iowa Supreme Court clarified when a property owner or occupier might be responsible for an injury, many of these factors are often hotly contested in slip and fall cases. You can expect that the property owner and the insurance company are going to fight hard to limit the liability of the property owner. Accordingly, you need to advocate for your full and fair recovery, but you don’t need to do it alone. Instead, you have the right to contact a slip and fall attorney to fight for you. For more information about how a slip and fall case works in Iowa and about your potential recovery, please call 1-800-800-5678 to schedule a free consultation with an experienced lawyer today. Posted on 08/04/2016 What Causes Slip and Fall Accidents?